Perugino means “a man from Perugia,” and that’s where Perugino grew up, in Perugia in northern Italy. It was just at the end of the Middle Ages. Perugino was about the same age as Leonardo da Vinci. The two teenagers probably were apprentices in the same painter’s workshop in Florence. But by the time Perugino was about 20 years old, he set up shop for himself. At first Perugino painted frescoes, like other Italian painters. His paintings, which were beautiful and calm, were very successful. They’re easy to recognize because Perugino had a habit of showing people with their heads tilted to one side. When he was in his early thirties, Perugino painted huge frescoes on the Pope‘s Sistine Chapel in Rome (but Michelangelo painted over most of these a little later). 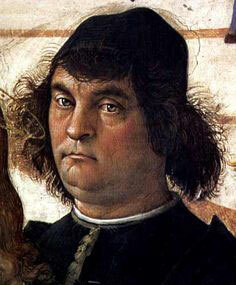 But Perugino was also one of the first artists in Italy who started to use oil paint. 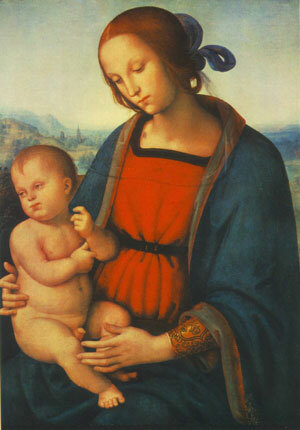 Perugino’s paintings became popular. He got pretty rich, got married, and had three sons. But after a while his paintings started to seem too quiet and boring – too old-fashioned – compared to Michelangelo and Leonardo da Vinci. They were doing the work of figuring out where people’s muscles and bones were, to make more realistic paintings. 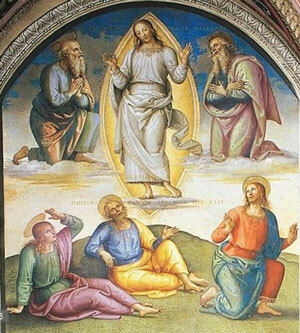 Perugino wasn’t doing that. Michelangelo even told Perugino that his painting was no good! Perugino was so bummed that he left Florence and went to Rome. When Perugino was in his forties, he took on a young teenager named Raphael as an apprentice. Raphael soon became more famous and successful than Perugino. Some jobs that people had promised to Perugino ended up going to Raphael. But Raphael died young, three years before Perugino. Perugino died of the bubonic plague in 1523 AD, when he was about 75 years old. Cite this page: Carr, K.E. 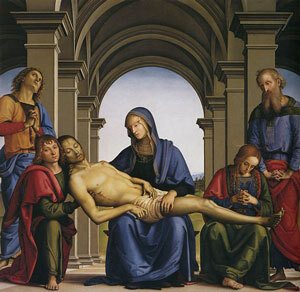 Perugino – medieval Italian painter. Quatr.us Study Guides, August 1, 2017. Web. April 21, 2019.